Originally dusk blue with black vinyl top and now red with white stripes and black interior. Much older repaint with some scrapes and chips. Still shows well as a nice driver. Interior is standard black vinyl that is original or very old replacement as it shows some wear on the drivers seat. The rest of the interior is nice. Tachometer and speedometer work. U17 center console gauge package that works with the exception of the amp gauge. Tilt wheel. Engine appears to be built as a 302 with many correct components including Winters casting intake, correct heads, DZ coded service replacement Holley carb, deep groove pulleys, correct casting # block, solid lifters, etc. Runs great with no weird noise or smoke. 4 speed manual transmission. Recent master cylinder, booster and proportioning valve. Factory 3:31 posi rear end. Like most Los Angeles Z/28’s, there is no way to verify if it a real Z/28 or not. No X-codes on the trim tag, etc. 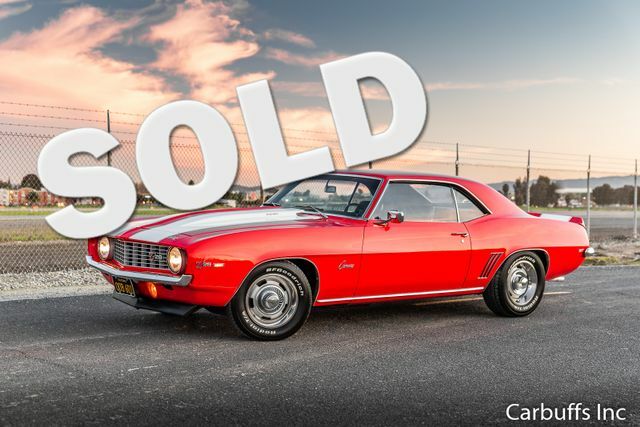 I believe it probably is a real Z/28 just by the amount of correct items on the car but I can’t prove it. Runs and drives great. Certainly gets attention.